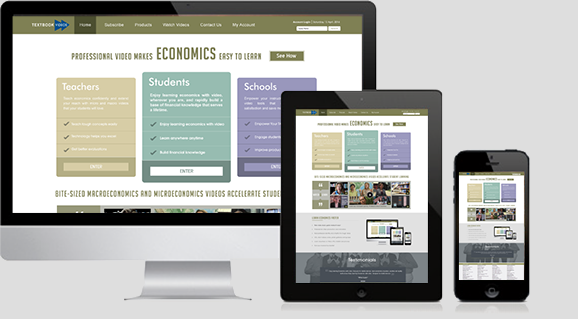 Teach economics confidently and extend your reach with micro and macro videos that your students will love. Enjoy learning economics with video, wherever you are, and rapidly build a base of financial knowledge that serves a lifetime. Empower your instructors and TAs with video tools that increase student satisfaction and save money. New video study guide makes it easy! The videos are very concise and to the point...the application of real world examples makes them very easy to follow. Three to five minutes is the perfect length! I think this effort is outstanding and I'm recommending it to my students. Your book is excellent. I like the videos a lot and I believe that they would be very useful to students as a study aide. They even helped me understand specific topics like Tax Multipliers better! I think this effort is outstanding and I'm recommending it to my students. Textbookvideos.com, Economics Learning Systems and PerformanceForward.com are divisions of Toteflix Inc. Copyright © 2019, Toteflix Inc. All Rights Reserved.